You may have started January addressing a number of resolutions; a more regular fitness routine, less boozing and a better diet to name a few. But have you thought about how you’re looking after your skin? With another year gone, it’s likely your skin is looking a whole lot less youthful than it did at the start of 2018, whether you’re sporting more visible lines, brown spots or a dryer complexion. Whilst we can’t stop the clock entirely, there’s plenty we can be doing to shake up our skincare routine to keep the complexion looking radiant and young. Get your anti-ageing skincare sussed with our guide below. Cleansing is essential for removing makeup and dirt, as well as pollution - a major cause of early ageing. However be mindful of the kind of cleanser you’re using as your skin matures; harsh cleansers will dry out the complexion, making wrinkles and lines more pronounced. Alternatively, try a cream cleanser which will leave the complexion clean but balanced without dehydrating the skin. In the evening, double cleanse to remove deeper level dirt and makeup with an oil-based cleanser to ensure your skin is not only squeaky-clean but nourished. As our skin becomes older, it loses its ability to repair and regenerate as efficiently which can leave it looking dull and uneven. Just as we exercise our muscles to stimulate muscle growth, exfoliation stimulates the skin cells to promote regeneration. Buff away dead skin up to three times a week using a gentle exfoliating formula, such as our Aquabella Purifying Cleansing Gel. The tiny micro-beads help to even out irregularities, revealing smooth and radiant skin. skin concerns such as dryness, wrinkles and dark spots. NUXE have a range of anti-ageing serums tailored to specific concerns and ages. To protect younger skin in your 20s or 30s from later ageing, opt for the Creme Fraiche Moisturising Serum. It uses plant milks and hyaluronic acid to to promote hydration for up to 48-hours and protect against pollution, a primary cause of early ageing. Our Nuxellence Anti-Ageing serums for night and day are great all rounders for ageing skin, holding 10 patents. Containing Passion Flower and Hyaluronic Acid to target the core skin cells, they help to support the skin’s health, correct pigmentation and reveal luminosity. For mature skin with more established lines and wrinkles, try our Merveillance Expert or Nuxuriance Ultra Anti-Ageing Serums. 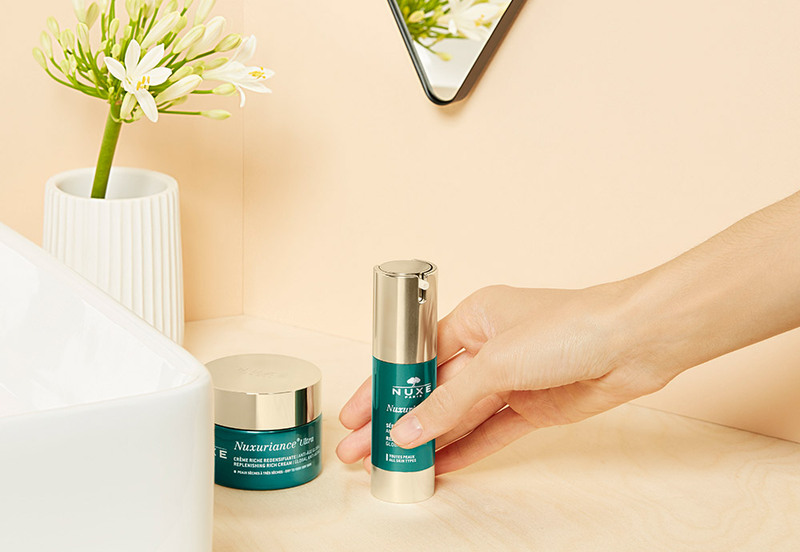 Ideal for women in their 40s, our Merveillance formula plumps, firms and restores tone, whilst our Nuxuriance Ultra formula for women over 50, redensifies deeper wrinkles and reduces the appearance of brown spots. Apply your serum by gently patting into dry skin before moisturiser. This will help your moisturiser to better penetrate the complexion and lock in hydration. Don’t forget to apply to the neck and decolletage, which are just as prone to ageing and wrinkles. With age comes less sebum and whilst this means the skin is likely to be less oily, it becomes all the more thirsty. Dry and dehydrated skin hugely increases and exaggerates the appearance of wrinkles but can easily be solved by twice-daily application of the right anti-ageing cream. The skin around our eyes is incredibly thin and delicate which means it’s more prone to obvious ageing. Daily use of a targeted anti-ageing eye cream will help to manage dark circles, puffiness, lines and wrinkles around the fragile eye-area. All of our key anti-ageing ranges feature a tailored eye cream to suit your skin ageing concerns. Our Nuxellence Eye Contour is a great place to start, with a decongesting applicator - the formula smoothes and illuminates the eye area, leaving it immediately more youthful. Apply your chosen eye cream by dispensing a small amount on your middle finger, and lightly tapping along your lower and upper eyelids. 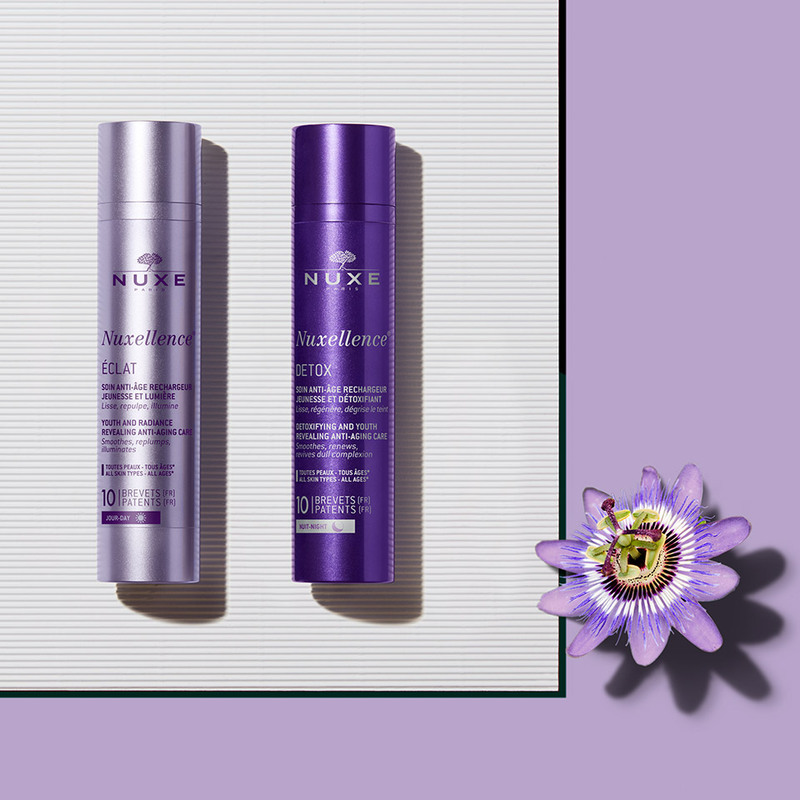 Shop and discover each of our anti-ageing skincare ranges on the NUXE site here.